Learn how to make your own DIY Star Wars inspired soaps with this DIY Star Wars melt and pour soap tutorial that creates fun Millennium Falcon and X-Wing Fighter shaped soaps soaring through the galaxy! This DIY Star Wars melt and pour soap tutorial will yield six soap bars. It is important to note I used a basic, rather than a natural soap base, as the natural soap base tended to cool too quickly for neatly made soaps. However, you can experiment with other bases if you’d like and it’s quite likely you may have more patience and a steadier hand than me. 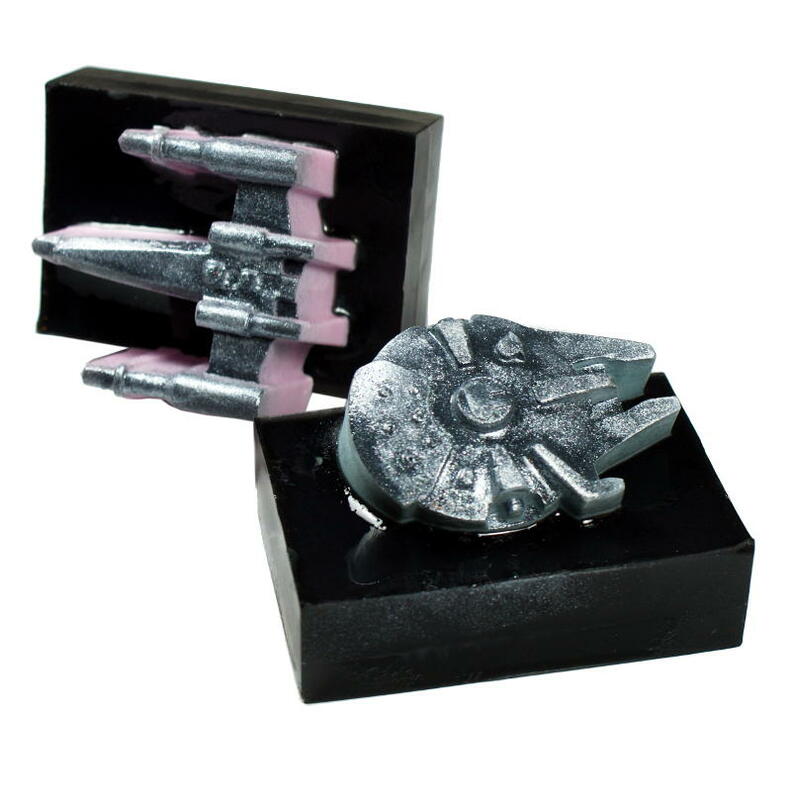 Also important to note is that with a natural soap base, the clay will not sink to the bottom – which will become the top of your DIY Star Wars soap embeds – as it does in the basic soap base so the final appearance will differ. 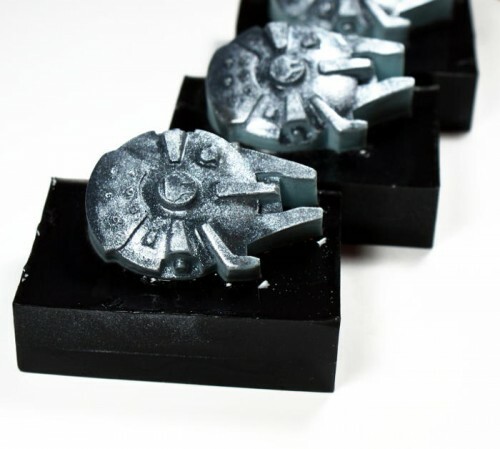 To make your DIY Star Wars soaps, you’ll begin by making the Millennium Falcon and X-Wing soap embeds. We will make the X-Wing soap embeds first. To do this, use a digital scale to weigh out 4.95 oz. of white melt and pour soap base. Using a Chef’s knife, cut it into chunks and place inside a Pyrex measuring cup. Heat for 30 seconds in the microwave. Remove the soap from the microwave using towel to grasp the handle of the measuring cup in case it’s hot, stir and add 1/8th chunk of one square of the pink pleasure soap color bar. Heat an additional 20-30 seconds until the soap is melted completely, watching to make sure it does not boil, then remove from the microwave and stir again until all of the color has dissolved and is evenly distributed. Now measure out and add 1/4 teaspoon of Australian Midnight Black Clay and stir well. Allow the soap to cool slightly, then weigh out .01 oz. of the fragrance oil you’ve chosen to use. Add the fragrance oil to the melted soap base and stir well. Set your Star Wars silicone mold onto a cutting board. Now slowly pour the melted soap evenly into all three of the Star Wars X-Wing mold cavities. Next, spritz the top of the soaps you just poured with alcohol to remove any air bubbles. You will now make the Millennium Falcon soap embeds. To do this, use a digital scale to weigh out 4.8 oz. of white melt and pour soap base. Using a Chef’s knife, cut it into chunks and place inside a Pyrex measuring cup. Heat for 30 seconds in the microwave. Remove the soap from the microwave using towel to grasp the handle of the measuring cup in case it’s hot, stir and add 1/8th chunk of one square of the neon bikini blue soap color bar. Heat an additional 20-30 seconds until the soap is melted completely, watching to make sure it does not boil, then remove from the microwave and stir again until all of the color has dissolved and is evenly distributed. Now measure out and add 1/4 teaspoon of Australian Midnight Black Clay and stir well. Now slowly pour the melted soap evenly into the remaining three Star Wars Millennium Falcon mold cavities. Next, spritz the top of the soaps you just poured with alcohol to remove any air bubbles, then using the cutting board for transport, transfer your soap filled mold into the refrigerator. You will now start on the base for your DIY Star Wars melt and pour soaps. To do this, begin by placing the 6-cavity rectangular mold onto a cutting board or small cookie sheet, then begin preparing the soap for this mold. Weigh out 19.4 oz. of the clear melt and pour soap base. Using a Chef’s knife, cut it into chunks and place inside a Pyrex measuring cup. Heat for 30 seconds in the microwave. Remove and stir. 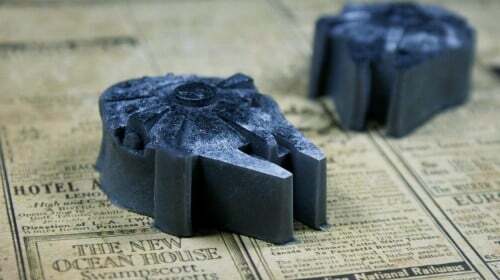 Repeat until the soap is almost completely melted then add one square of the black sparkle soap color bar. Stir well, then continue heating in 30 second increments, stirring in between heatings, until the soap is melted completely. Remove the melted soap carefully from the microwave and allow the soap to cool slightly. Now weigh out .35 oz. of fragrance oil and stir into the melted soap base. Now spritz the top of the soaps you just poured with alcohol to remove any air bubbles and use the cutting board for transport to place your soap filled mold into the refrigerator. Once the refrigerated soap has solidified and cooled completely, remove both of the molds from the refrigerator. 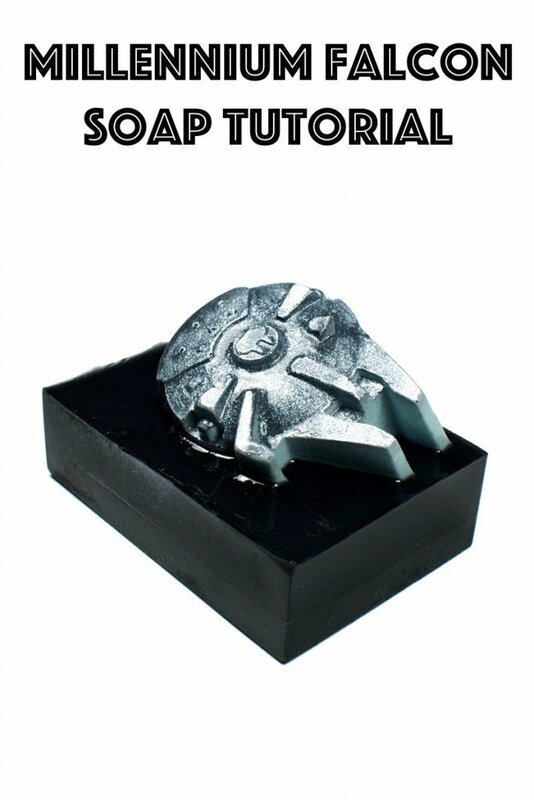 Carefully remove all of the X-Wing and Millennium Falcon Star Wars soap embeds from the mold and set on a flat surface. Using your finger as a brush, “paint” the tops of each of the soaps with the Diamond Dust mica until the tops are covered. They do not need to be evenly covered. This will make the tops look like metal. Gently blow the tops of the soap to remove any excess mica. 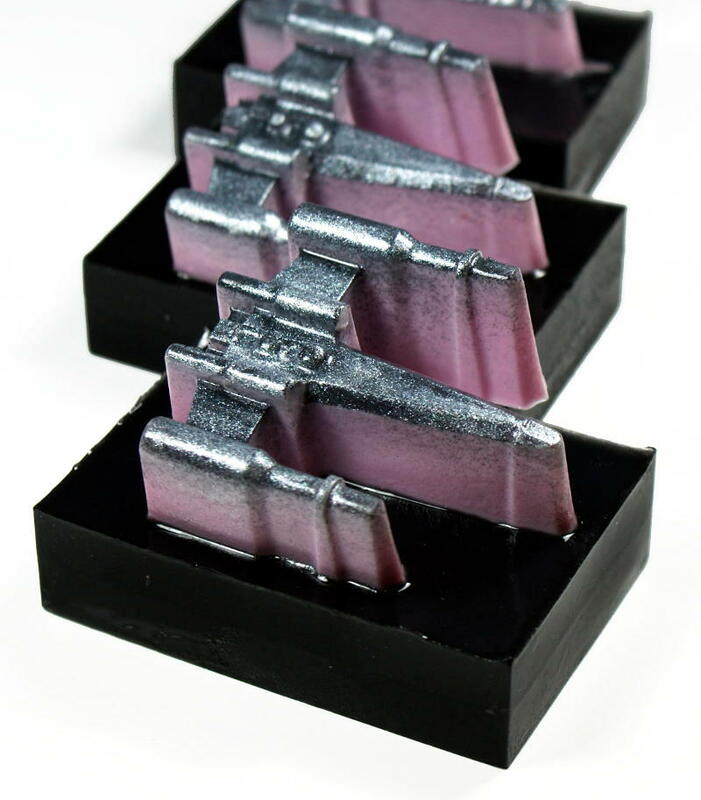 Now set each of your Star Wars soap embeds into each of the six cavities of your rectangular mold so that one edge of each of the X-Wing soap embeds and the Millennium Falcon soap embeds are set outside of the mold cavity and on top of the edge of the mold. Re-heat the remaining black tinted soap base from earlier just until it is smooth and fully melted again. If you overheat the soap, allow it to cool slightly. Otherwise the soap may cause the Star Wars soap embeds to bleed. Now pour all of the remaining black tinted soap into the six rectangular mold cavities that contain the Star Wars ships until they are full. Spritz the top of the soaps you just poured with alcohol to remove any air bubbles and again use the cutting board for transport to place your soap filled mold into the refrigerator. Once your DIY Star Wars melt and pour soaps have solidified and cooled completely they are ready! Simply remove them from the silicone mold. If your DIY Star Wars melt and pour soaps have fingerprints where you removed them, simply spritz the outside of the finished soaps with rubbing alcohol and allow to dry. This will give them a glossy finish and remove any fingerprints. It will also add to the metallic look of the ships. Now wrap your finished soaps in food service film and gift to your friends and family! To figure out how much soap you need for your new Star Wars soap molds, simply melt down some of your melt and pour soap base and pour it into one cavity of the new mold. You’ll then use your digital scale to weigh out the amount of soap that cavity will hold. From there you’d use simple math to determine how much base to use for the number of DIY Star Wars soaps you’d like to make. Fragrance oil is typically used at about 2% of the soap weight. Therefore to determine the amount of fragrance oil you’d need simply multiply the weight of your soap base by 2% or .02. If you liked this DIY Star Wars melt and pour soap tutorial you may also like my DIY Star Wars jelly soap recipe. My Star Wars jelly soap recipe features miniature Millennium Falcons – that use the same mold as this project – and heart shaped jelly soaps that jiggle just like Jell-O. These make wonderful DIY Valentine’s Day gifts for any Star Wars fan! Plus they’re really easy to make and require minimal ingredients. You can find my jelly soap recipe here. For more of my homemade melt and pour soap recipes as well as other bath and beauty DIY’s be sure to follow me on Pinterest. You can also find and follow me on Blog Lovin’, Tumblr, Facebook, Twitter, G+ and Instagram.